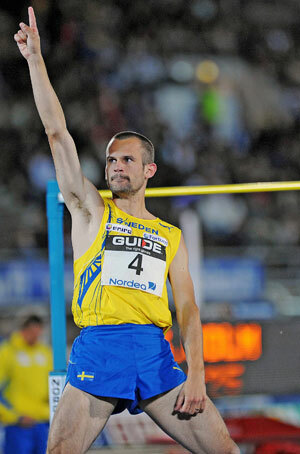 Stefan Holm (SWE) is the 2004 Olympic Champion in high jump and also won four World indoor championships titles during his career. He retired after the 2008 Olympics and received the IAAF Distinguished career award at the 2008 World Athletics Gala in Monaco. He really like books – all kinds of them – including those about track and field. – The ranking section in World’s Greatest in Athletics is very interesting! The authors pick for the top-10 best of all time in all events based on merit is fascinating reading. It’s also a great honour to be one of those ten in the high jump! Others in that section are Patrik Sjöberg and Dietmar Mögenburg who were my role models when I grew up and Sjöberg was the reason why I became a high jumper. Others on the list, for example Valeriy Brumel, is the kind of legend I have read a lot about, says Holm. "This kind of book really gives a perspective of our sport. There’s so many great men and women that passed through the history and here they are with their careers summarized in one book!" – I also like the deep all-time lists. I have enjoyed Peter Matthews' 50 deep lists in the ATFS annual book ATHLETICS for many years and in this book the top-500 is listed! And also the top-100 performances in each event! – Nowadays a lot of statistics in athletics is to find on the Internet and when it comes to all-time lists they are often constantly updated. This book gives us the lists as at 1 January 2015 which is good from a historical perspective, it’s the actual all-time lists for now. "World’s Greatest in Athletics is a must for all who like our sport. A great book which make it possible to compare thousands of great performances." Today Stefan Holm work’s as a communicator at Karlstad University. He is also a member of IOC (the International Olympic Committee), high jump coach, giving lectures, doing TV jobs etc.